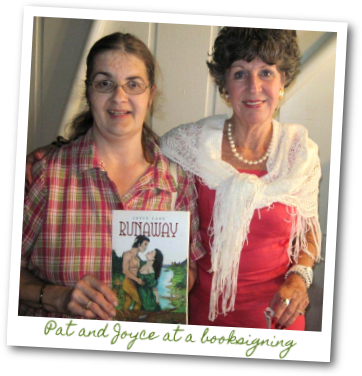 Pat Bollack Brown created the artwork for both Runaway and the upcoming Stay the Course, which so captures the spirit of the era and the author’s vision. Pat was inspired to become artist by a well-known artist in her hometown of North Lewisburg named Frances Moore. She had gifted one of her watercolors to Pat’s mother as a wedding present. It hung in her family’s living room in a place of honor. It is a drawing of a young woman with black hair like Pat’s mother. After graduating from Columbus College of Art and Design, she came back to North Lewisburg and married the love of her life, Bryce Brown. In addition to book illustration, Pat paints murals, does pencil drawings, landscapes, and custom artwork to suit clients’ needs.